Qt Quick is a collection of technologies that are designed to help developers create the kind of intuitive, modern, and fluid user interfaces that are increasingly used on mobile phones, media players, set-top boxes, and other portable devices. Qt Quick consists of a rich set of user interface elements, a declarative language for describing user interfaces, and a language runtime. A collection of C++ APIs is used to integrate these high level features with classic Qt applications. Version 2.1 of the Qt Creator integrated development environment (IDE) introduces tools for developing Qt Quick applications. QML is a high level, scripted language. Its commands, more correctly elements, leverage the power and efficiency of the Qt libraries to make easy to use commands that perform intuitive functions. Drawing a rectangle, displaying an image, and application events -- all are possible with declarative programming. A QML element usually has various properties that help define the element. For example, if we created an element called Circle then the radius of the circle would be a property. 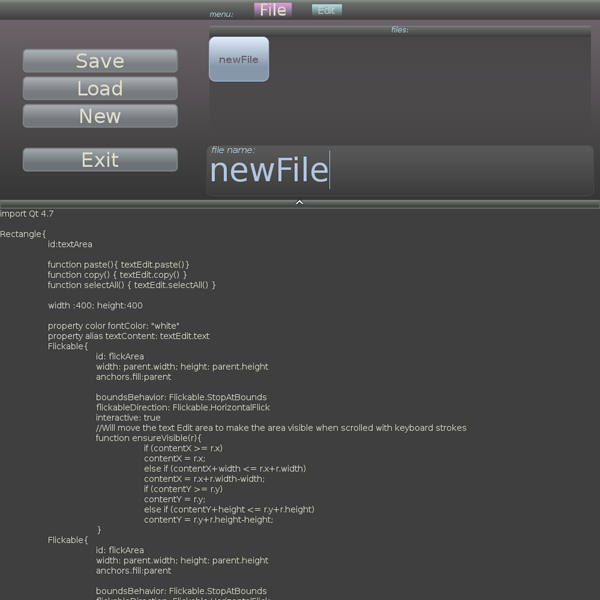 Building user interfaces by importing these elements is one of the great feature of QML and Qt Quick. In conjunction with the QML language, the QtDeclarative module separates the interface logic in QML from the application logic in C++. Qt Creator is a complete integrated development environment (IDE) for creating applications with Qt Quick and the Qt application framework. Get started with Qt Quick application development quickly and easily with examples, tutorials, and project wizards. Design application user interface with the integrated editor, Qt Quick Designer, or use graphics software to design the user interface and use scripts to export the design to Qt Quick Designer. Develop applications with the advanced code editor that provides new powerful features for completing code snippets, refactoring code, and viewing the element hierarchy of QML files. Build and deploy Qt Quick applications that target multiple desktop and mobile platforms, such as Microsoft Windows, Mac OS X, Linux, Symbian, and Maemo. Deploy applications to mobile devices and create application installation packages for Symbian and Maemo devices that can be published in the Ovi Store and other channels. Easily access information with the integrated context-sensitive Qt Help system. The Qt Quick page has links to various Qt Quick topics such as QML features, addons, and tools. The QML Examples and Demos page has a gallery of QML applications.